In it's early days the American Cocker Spaniel was used to flush and retrieve birds such as grouse, woodcock (from which the name “cocker” derives) and pheasant. Today it is kept almost exclusively as a companion. The American Cocker Spaniel evolved directly from English Cocker Spaniels imported into the United States from England in the 1870s. While these early dogs were used in the field, show breeders in the 1930s began developing the line toward smaller companion pets. Hunters desired the line to remain unchanged and soon two had diverged to the point that they could no longer be considered the same breed. In 1946 the American Kennel Club settled the matter by recognizing them as two separate breeds, the English remained in the field, while the American settled into the show ring and pure companionship. 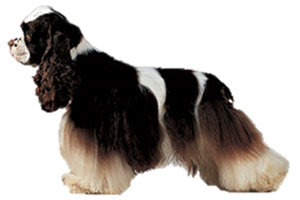 Is the American Cocker Spaniel Right for You?